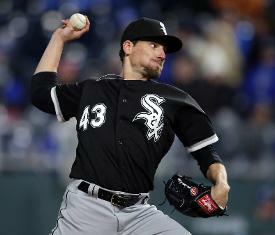 Right-hander Danny Farquhar has agreed to sign a Minor League deal with the New York Yankees just nine months after sustaining a brain hemorrhage, according to multiple media reports. Farquhar collapsed in the dugout on April 20 after pitching two-thirds of an inning of relief for the Chicago White Sox. He told a team trainer that his head hurt, and then he collapsed. Doctors determined Farquhar sustained a ruptured aneurysm. He underwent multiple surgeries and was released from the hospital on May 7. Farquhar, who turns 32 next month, was determined to make a comeback and expressed multiple times that he hoped to pitch again in the majors. Farquhar is 10-15 with a 3.93 ERA in 253 career relief appearances with the Toronto Blue Jays (2011), Seattle Mariners (2013-15), Tampa Bay Rays (2016-17) and White Sox (2017-18). He was 1-1 with a 5.63 ERA in eight appearances with the White Sox in 2018 prior to his injury.